So obviously I wasn't ready to remove my rainbow dot mani but due to the crappiness of Seche Vite's top coat, I had to. I made a post on how unhappy I was with Seche on Instagram but I'm going to go into a little more detail here now. Now I know that a lot of people love Seche and have no problems with it at all. And I didn't either, until about 3 months ago. And since then it's just been HORRIBLE! Maybe my huge refill bottle was a bad batch or something, but it's just been so frustrating!! I always clean up my polish if I have to before I Seche my mani because I read that Seche shrinkage is less likely if it is in contact with the nail the whole way around the cuticle. I ALWAYS wrap my free edge which is usually the main answer to my most common problem. 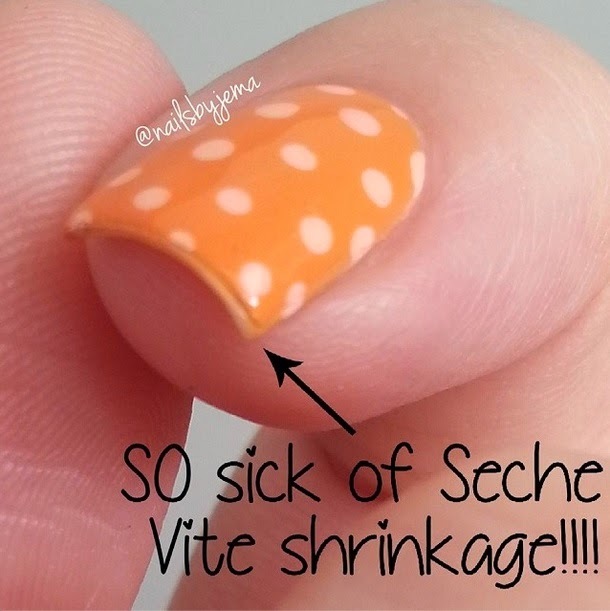 Now, before you say it, I know you can get Seche Restore to help thin your Seche Vite when it starts to go claggy. And I have it. And use it. And because I use it so much I probably need to buy another one. But that annoys me even more!!!! Seche can't make a top coat that stays thin and consistent and then CHARGES YOU MONEY to buy another product to FIX THEIR DEFECTIVE TOP COAT!!!!!!! My mani is usually fine for the first 6-8 hours with Seche. No shrinkage. And then 12-24 hours later.... BAM!!! It's all pulled up from the edges!! Mani ruined!! I had just added restore before doing the mani above and it still happened. I wrapped my edge and it still happened. All I can think of is that my super hot showers are making the Seche react the next day?? And I have always taken almost scalding showers and if 35c summer heat can't stop me from taking them then a top coat won't either!! The polish is dry, so why would a shower make it shrink all of a sudden?? What I find the most annoying is that my mani is fine for the first half a day/day and then the next day it's ruined and I have to deal with the epic shrinking from my edge and sides/cuticle of my nails. If I don't take a photo right away, forget about it. It's ugly. I will be swapping to Glisten And Glow HK Girl Top Coat as soon as I can afford it as I have heard nothing but GLOWING reviews for that top coat and I cannot wait. The possibility of being able to wear a mani for more than two days without it being ruined and chipping off is so exciting!! Anyway... onto the new nails! So this is kinda the flow and wave of dots I was going for with my rainbow dotticure but I got dotting tool happy and ended up covering my entire nails with them! So I thought I would try again, on black, and with a mixed colour wave! I used pretty much the same colours as my last dot mani (I took a few of the darker colours out to make it brighter) but the trick is to add a dot of white first and then go over it with the colour. On a few of the smaller orange dots, I went over the white edge and you can really see the colour difference. It just looks so dull and muted without the white to make it pop! I think it turned out swell. Why don't people say swell anymore? It's a fantastic word!!! Anyway... 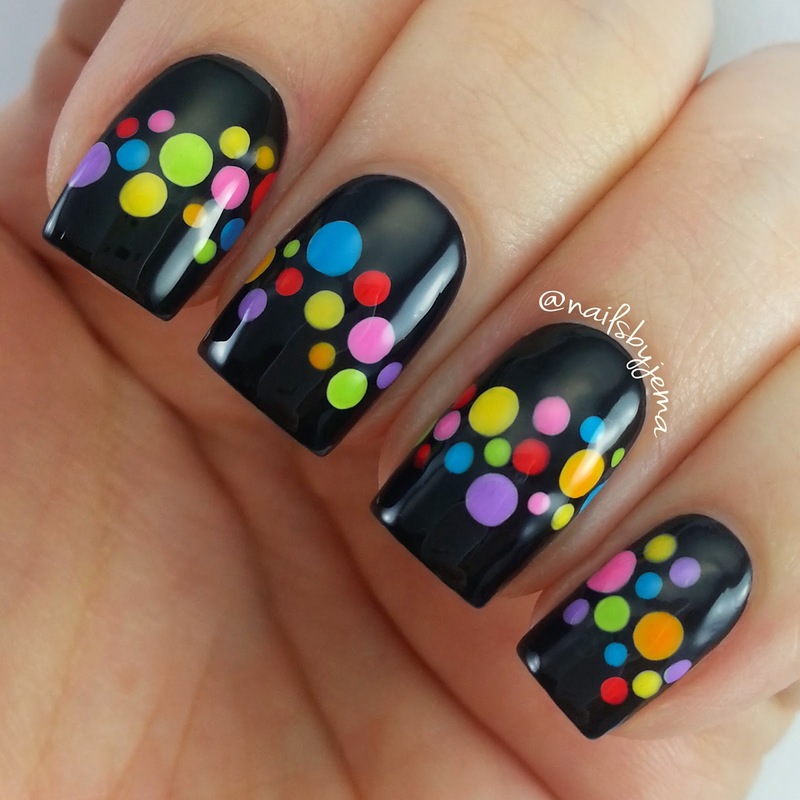 DOTS!! What do you think?? Which do you prefer?